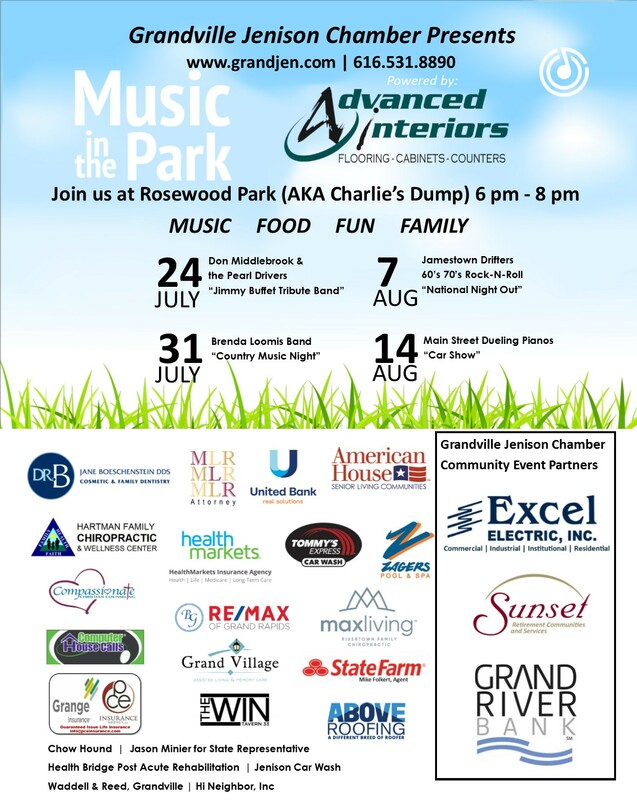 Bring your chair or blanket, pack a picnic (or purchase dinner at the park) and bring the entire family to enjoy LIVE and FREE entertainment at our 3rd Annual Music in the Park Series at Rosewood Park which features a playground and mini splash pad. Limbo Contest at intermission - Sponsored by Tropical Smoothie Cafe -Winner gets $25 gift card to Tropical Smoothie Cafe. D & D's Gluten Free on BBQ pulled pork fries, rice & bean bowl, chicken strips, fried cauliflower, cheesy fries and side of fries. Popcorn Creations - $4 Michigan Mix, Caramel, Kettle, Dill Pickle, Butter, and Tutti Frutti. Grand Village Assisted Living & Memory Care - Activity books available for kids (color a parrot, color a cheese burger, word search, dot game). Tommy's Express Hiring in Jenison for this Fall - Stop by to get details! They will also have free Tommy's Express gear. Advanced Interiors - Presenting Sponsor / Stop by to see the latest trends, get a freeze pop and helium balloons. Advanced Interiors - Presenting Sponsor / Stop by to see the latest trends, get a freeze pop and beach ball..
Chow Hound - Face painting & free dog tags. Chow Hound - Frisbee painting and coloring station set up.